The year I was 9, my mom surprised me with my Toni Doll, she came in a suitcase with dresses on hangers and underware and socks in drawers and a pair of roller skates. My mom's life was hectic and exhausting, raising a family, she was always canning in the summer and sewing in the winter, making clothes for everyone in the family including my doll, she was the only woman except Mary Hartman who you would find under the dining room table cleaning the underside with her bubble gum smelling furniture polish. That Christmas Toni dolls were all the rage, they were made by the Toni Home Permanent Company and their hair could be combed and shampooed. There was a special kit to give the doll curly hair with a sugar and water solution. I hoped for a Toni Doll, but did not expect such an extravagant gift. As I ran to the tree, Christmas morning, I only had eyes for the big box with my name on it. As it was handed to me, my heart was pounding, could it be? I ripped open the paper and there it was, the trunk that could only be holding one thing, a Toni Doll. 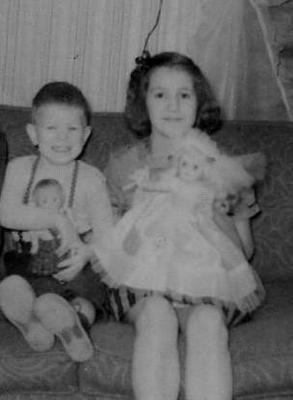 As I opened the trunk, not only was a Toni Doll inside, but she was wearing a wedding gown and there was a rose colored ball gown hanging on a hanger along with 5 other dresses and a drawer for her underthings, a pair of Mary Janes, boots and a pair of roller skates sitting on the shelf. My mom's sister made the wedding dress, veil and ball gown, she made the same for her daughter, we both got the dolls at the same time. I named the doll Sweetie and cherished her and kept her in perfect condition. I made more clothes for her, each outfit getting better than the last, she had more clothes than I did. When I left my husband, I knew she was in his attic, I wish I would have taken her back to my mom's, but he said my stuff would be OK, maybe we thought I would be back. By the time I decided to get my stuff back, someone told me he had a yard sale and sold everything, my yearbook, my brownie and girl scout badges, everything was gone, including my beloved Toni doll. His son said that didn't happen, but he would never talk to me or tell me what happened. Where ever Sweetie is, I can't get her back, I just hope whoever has her is taking good care of her. I can still see her and the little trunk with the flowered lining as though I were finding her for the first time.